While doing research for my theology paper on the Holy Spirit, I came across this icon on the title page of my Pneumatology book (See icon below to the left). Looking at all its intricacies, I observed the icon for a few minutes. (As a designer, that’s what I like to do.) Then, I had my “aha” moment! Wow, this icon is cool! So simple, yet so direct! Do you see it?? It’s a symbol for the Holy Spirit. The icon represents these four symbols of the Holy Spirit: water, fire, oil and a descending dove. Awesome!! I had been thinking about an icon for this blog for quite a while. Something that resembled a passion for Christ. At first I thought about a symbol for fire, to represent being on fire for God. Then I thought about a river, to represent flow and vitality. I did some sketches, but nothing seemed to stick. Ultimately, I wanted something that represented fire and water, purification and cleansing – the Holy Spirit. After having my realization of the icon in my book, I immediately thought, this will be the icon for Afire Within (with some slight modification)! 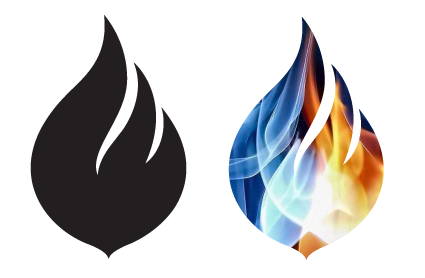 I added an image of flames inside the icon that is both orange and blue, and if you look at the flames closely you might be able to make out the white shape in the middle where the blue and orange overlap. There, the white shape looks like a dove descending.